Printers sell at many different price points, and it can be tricky to nail down which features you need and which specs you can skip. So we split our list of premier printers into different categories to help you find precisely the printer you need. With around 540,000 adults starting a self-owned business each month,1 you know you need to make sound purchase decisions for your small business if you want to keep pace. When you decide you need an office printer for invoices, promotional materials, or witty interoffice memos, the variety of printers available might seem overwhelming. To ease your burden somewhat, let’s start with Business.org’s top five picks for small-business printers, as well as some essential info on printer categories and features. Printers sell at many different price points, and it can be tricky to nail down which features you need and which specs you can skip. So we split our list of premier printers into different categories to help you find precisely the printer you need without handing out extra cash for unneeded features. Our best all-in-one printer is a general option that covers everything the average business needs. We also picked our top low-price printer for solo entrepreneurs who just require the basic functions to keep business rolling. In case your office prints a lot of documents day-to-day, we offer a choice for the best high-volume printer. Or if you value portability above prompt print speeds, you can check out our top portable printer. We also supply our pick for the best all-in-one photo printer for those businesses that print more than text and the occasional pie chart. What are the best office printers? Data effective 7/3/18. At publishing time, pricing and features are current but are subject to change. Offers may not be available in all areas. How do I choose between a laser and inkjet printer? When choosing a printer, you’ll come upon a major decision: laser or inkjet? Laser printers use—you guessed it—a laser to attract a type of powdered ink called toner to the page. Inkjet printers, on the other hand, drop liquid ink directly onto the paper. One key factor when deciding between the two is cost. Inkjet printers generally have a cheaper up-front cost, with both the printer and initial ink cartridge running much cheaper than a laser printer and toner cartridge. However, ink cartridges run out more quickly and often end up costing more in the long run. Also, laser printers run more quickly once they’ve had a chance to warm up, so long print jobs might favor the laser. Inkjet printers tend to perform better with graphics and especially photographs, so if you often print design-heavy documents, go for ink. You should also consider what type of paper you’ll want to print on: laser printers generally perform best with standard paper types. What’s included in an all-in-one printer? If your office needs to house a separate printer, scanner, and fax machine, you’ll run out of room rather quickly. Fortunately, many available printers are inkjet or laser all-in-one (AIO) printers, which combine all those capabilities into one package. In addition to saving space, AIO printers also make maintenance a breeze with just one instruction manual and one type of driver to update. With modern multi-function printers, you don’t necessarily need to sacrifice the quality of one component by purchasing a printer that does it all. You can get quality scanning, copying, faxing, and even photo printing all in one machine. However, if you need to make lots of scans or copies daily, make sure your printer has a feeding tray that allows you to pre-load multiple documents instead of scanning each document one by one. Similarly, not every AIO printer will scan or print photos at ultra-high resolutions, so make sure to check the printer’s specifications before buying. When are printing speed, volume, and quality most important? Of course you’d love to have a printer with the highest-quality resolution and the fastest printing speeds no matter how much you print, but not every small business needs or even wants a costly printer with the highest specifications. So how do you know which numbers to pay most attention to? For printing speed, you’ll want to check out the machine’s listed pages per minute (ppm). Generally, a high ppm is a luxury, but there are a couple exceptions. If your company has multiple users printing at any given time, faster speeds will help keep tempers from flaring when someone’s single-page print job ends up at the back of the line. Additionally, if your business needs to print documents that contain high page counts, like the next fantasy novel manuscript your editor needs to cover in red ink, a faster ppm will cut down on lost time. So the higher volume of printing your business needs, the more important speed becomes. When it comes to the volume of documents you print, there’s another number you might want to check out: paper capacity or loading tray capacity. This number represents the maximum amount of paper you can load at one time. The less you have to fiddle with that loading tray, the better. If you think your small business’s average printed pages per day will outnumber the printer’s paper capacity, you might want to look for a higher capacity. For your basic business printing needs, the level of quality you’re seeking might be “good enough.” After all, those invoices only need to be readable and not works of art. But if you print fancy reports for clients or photographs for any reason, then quality becomes a top priority. Check out the printer’s resolution, listed in dots per inch (dpi). This number indicates how many tiny dots of ink your machine can fit into one square inch of paper. The higher the dpi, the higher the resolution you can print. Now that you know the basics of printer categories and features, you might want to take a closer look at each of our five picks. We’ll also compare some of our preferences with a few honorable mentions that didn’t quite make the cut. This OfficeJet all-in-one printer packs a lot of helpful features into one efficient machine. And at under $100, you get a lot for your dollar. The average small business or home office benefits from this printer’s scanning, copying, and faxing capabilities, so the 4650 is both our pick for best all-in-one printer as well as our top pick overall. Print directly and wirelessly from a smartphone or tablet (with no network needed) using Wi-Fi Direct. Scan or fax up to 35 pages in one load with an automatic document feeder. Utilize cloud printing services like Google Drive or Apple AirPrint. Halve your paper usage with double-sided printing. Print both text and photos with clarity and rich colors. The right printer for . . . When budget comes first, this all-in-one wireless printer comes with an attractive price. Rest assured that even this budget printer offers many useful features, from mobile printing to an auto document feeder. And don’t forget that the compact size works great for smaller spaces, whether you use it with a laptop or a desktop. Data effective 6/3/18. At publishing time, pricing and features are current but are subject to change. Offers may not be available in all areas. Does your business need snappy duplex printing speeds? This laser printer can print both black-and-white and color documents at 33 pages per minute (ppm). How about a high-capacity tray to cut down on refill time? Then you’ll appreciate this model’s standard 800-paper capacity with three different trays. This device offers all the traditional features of a wireless all-in-one printer along with a compact size and battery power so you can stay unplugged. With this device, you can print high-quality photographs in addition to the typical features of an all-in-one office printer. If you’ve been saving high-quality color prints for a printing company instead of your office, you can now keep more of your printing within the office. What are the best office printer scanners? Many of the top picks and honorable mentions in this article are all-in-one printers. All-in-one, or AOI or multi-function, means you can scan as well as print. Our top overall printer, the HP OfficeJet 4650, is an all-in-one printer that scans, copies, faxes, and prints. And its automatic document feeder allows you to load multiple pages for scanning in one go, instead of scanning one page at a time. I want that laser! 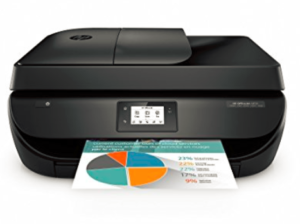 What are the best office laser printers? We looked at a few laser printers in our lists. Our pick for the best high-volume printer, the Brother HL-L8360CDWT, is a great laser printing option for small businesses. Its high print speed and multiple loading trays add extra value to the typical benefits of a laser printer. What type of printer is needed to print checks? Many models of the most popular printer brands can print checks, but you’ll want to use a special type of ink—or toner, for a laser printer—called MICR ink. This will help the bank quickly process the check and help your business avoid any service fees. Don’t forget that the best printer is one that fits your small business’s needs, whether that’s a laser-focused monochromatic laser printer or a well-rounded all-in-one printer. When reviewing features and specifications of our recommended models, be sure to compare them with other printers you’ve been considering. Found a printer that fits your company’s needs perfectly? Let us know in the comments below!